TOKYO--(BUSINESS WIRE)--Morinaga Milk Industry Co., Ltd. (TOKYO:2264), a leading Japanese dairy product company, today announced that its recently launched “Immunogenics” ingredient LAC-Shield will now be marketed overseas. The product, a heat-killed strain of beneficial Lactobacillus bacteria (Lactobacillus paracasei MCC1849), has been clinically shown to have immune-enhancing benefits. Yet because it has been pasteurized, LAC-Shield does not pose the stability issues of traditional probiotics. Probiotics are widely consumed in various foods and dietary supplements by people worldwide for a range of health benefits, including their positive effect on immune function. However, there are application challenges when formulating with probiotics, since live bacteria often do not survive at high temperatures or under high water-activity environments. “LAC-Shield is unique because it can be added to a wide range of foods and beverages in which conventional probiotics can’t survive. This high level of versatility has helped us achieve great success in the Japanese market,” Dr. Fumiaki Abe, General Manager of Morinaga’s Food Ingredients & Technology Institute, emphasized. More than 150 food companies are currently using LAC-Shield for various food and beverage applications in Japan. It is well established that the gut microbiome interacts with the mucosal immune system, and scientists now believe that microbes have a much greater impact on immune function than previously realized, whether the bacteria is alive or dead. Taking this research into account, Morinaga Milk screened a number of strains of helpful bacteria to select the one with the highest potential to enhance the immune system in its development of “Immunogenics” LAC-Shield. 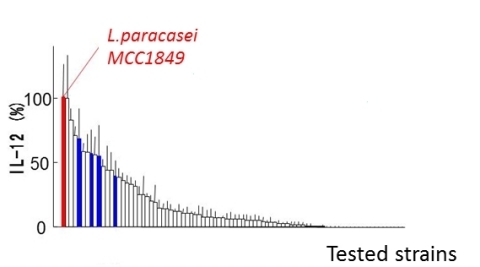 The company selected the strain Lactobacillus paracasei MCC1849 from its collection of thousands of cultures because it showed an immune-stimulating effect even when pasteurized, as measured by its ability to induce the production of IL-12 (a cytokine that activates cellular immunity) by immune cells (Fig. 1). A new human clinical study collaborating with Professor Koshiro Miura and Associate Professor Junko Kondo of Kyushu Women’s University examined the effect of LAC-Shield on the common cold in 241 healthy women over age 18. Participants were randomized to receive either LAC-Shield (10 billion or 30 billion cells) or placebo powder every day for 12 weeks. Subjective symptoms of the common cold — such as cough, sore throat, sneezing, nasal congestion, headache, malaise, and fever — were recorded every day for 12 weeks. At the end of the study, among subjects who had caught a cold within the past year, LAC-Shield (10 billion cells) significantly reduced the incidence of the common cold, the total number of days symptoms lasted, and symptom severity score. These results were presented at the International Union of Microbiological Societies conference held in Singapore July 17-21, 2017. Another human clinical study on LAC-Shield was conducted by Dr. Michio Murayama of Tanashi Hospital in a population of 42 elderly subjects living in nursing homes.1 Participants were randomized to receive either LAC-Shield (10 billion cells) or placebo by jelly every day for 6 weeks during the winter. They also received an influenza vaccination containing three viral antigens (A/H1N1, A/H2N3 and B) in the third week of the study. Researchers compared the antigen titer to vaccine antigen at the beginning and end of the study. Antibody response to vaccination typically declines with age, becoming especially weak in the very elderly and rendering them vulnerable to infectious disease, even when vaccinated. However, supplementation with LAC-Shield improved the impaired antibody response to the A/H1N1 and B antigens in the subgroup of those over 85 years old. Hence, LAC-Shield increased the efficacy of the influenza vaccination by enhancing immune response. Morinaga Milk Industry Co., Ltd. is one of the leading dairy product companies in Japan. Morinaga started research on bifidobacteria in the 1960s, inspired by the fact that bifidobacteria are the predominant bacteria residing in the intestines of breast-fed infants. In 1969, Morinaga isolated its flagship strain Bifidobacterium longum BB536 from an infant. Currently, Morinaga is launching a unique probiotics-derived “Immunogenics” product, which expands the number of possible applications for probiotics. Morinaga is celebrating its 100th anniversary in 2017. Morinaga Milk Industry launched a new "Immunogenics" ingredient LAC-Shield that offers manufacturers clinically tested immune benefits.